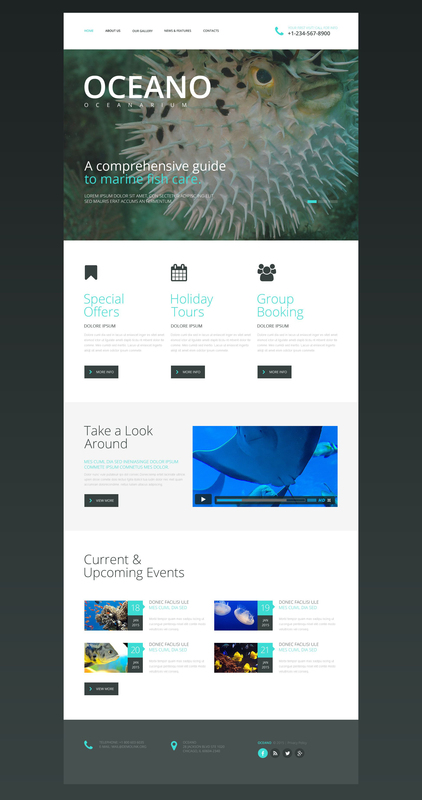 Here is a current oceanarium website template. Its huge slider shows the most exotic fish you've ever seen. Fish photos are accompanied by short text. Flat icons and buttons impart the layout a clean, simple look with enough white space to breathe. The embedded videos make the website really spectacular. Current and upcoming events are featured together with high-quality images. Company contacts as well as their social media block are at the footer of the page. Grey and motton blue color scheme is a good solution for such kind of theme.